Meatballs and Spaghetti may be a match made in heaven but Meatballs in curry are not very far behind. 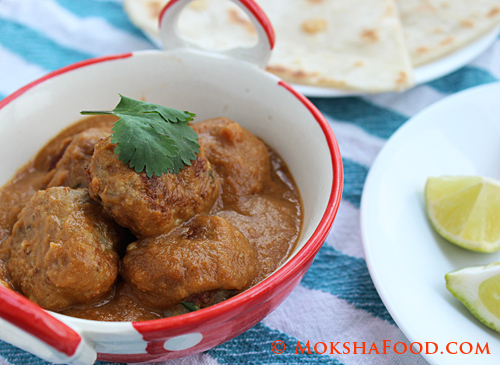 Commonly known as Kofta Curry, the meatballs are made up of either minced goat meat or chicken. The koftas have a choice of being deep fried or steamed or poached directly into the curry sauce. Fried version is the tastiest for obvious reasons but also the highest in calories and oil consumption. Poached option can be tricky as the koftas could burst open if not handled carefully. Steamed version was not preferred by my family as it doesn't give a nice crisp coat to the koftas. So I figured out a fourth option of pan frying the koftas. This is slow process but gives a nice brown coat and cooks the koftas well in couple of tablespoons of oil. The koftas tasted great by themselves but had to resist and hide them so they could make their journey into the curry sauce. Chicken Kofta curry was finally ready and we enjoyed it with homemade Gluten free Naan. Take a large bowl and marinate the minced chicken with all the ingredients for the meatballs/koftas. Keep aside for at least 30 mins. In a large saucepan, take 2 tbsp of oil and heat it to medium. Roll the marinated minced meat into lemon sized balls. Gently place the meatballs on the heated pan making sure they don't touch each other. Add only few meatballs at a time. Lower the heat now. After a min, gently nudge the meatballs and roll it over to cook the other side. Cook the meatballs turning evenly all over. Cover and cook on low heat for atleast 10 mins. This is to pan fry the meatballs instead of deep frying them. After frying all the meatballs, keep them aside. In the same pan, add the chopped onions and saute till brown. Add in the ginger, garlic and tomatoes and cook till they form a nice mushy sauce. Remove; cool and grind to a smooth paste. In the same pan, add the remaining 1 tbsp of oil to medium heat. Throw in the whole spices like bay leaf, cardamoms, cloves and cinnamon. Once a nice aroma emanates, add the ground paste. Now add the dry spice pdr -red chili pdr, cumin pdr and garam masala. Cook this mixture for another 5 mins. Pour the cream or beaten yogurt into the sauce. Add sugar now to balance all the flavors. Drop the koftas gently into the sauce and lower the heat. Let them rest for 8-10 mins to absorb all the flavors together. 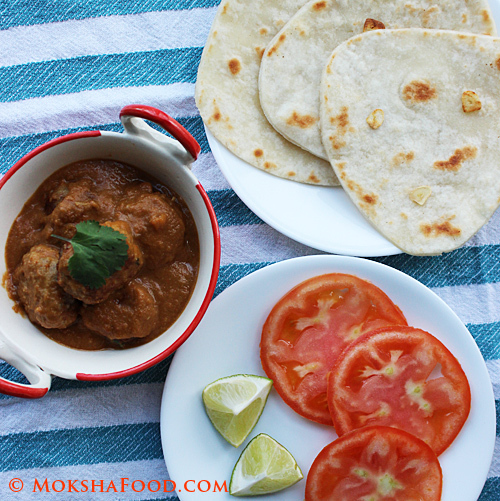 Serve Chicken Kofta curry with your favorite bread or rice.